A regional daily journalist who campaigned to save a magistrates’ court on her patch from closure has welcomed a government decision to keep it open. 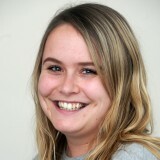 HTFP reported in January how Cambridge News court reporter Tara Cox, pictured, had urged the Ministry of Justice to reconsider its plan to shut Cambridge Magistrates’ Court, citing the impact such a move could have on defendants who live on her patch. This week the MoJ revealed it would not be shutting Cambridge after all as part of cuts to the courts service. However, planned closures to courts in Banbury, Chorley, Fleetwood, Maidenhead and Northallerton will still go ahead, with two in London also shutting. Of the decision to keep Cambridge open, Tara told HTFP: “I am so pleased and relieved to have heard the news that Cambridge Magistrates’ Court will stay open. If the closure had gone ahead, the nearest magistrates’ courts to Cambridge would have been in Huntingdon, 18 miles away, or Peterborough, almost 40 miles away. Tara added: “This was not justice staying local. Under the consultation, an impact report said if the court was to close, people’s journeys by public transport to attend court cases would almost double – from 55 minutes to 90 minutes. Journeys by car would have also increased by 15 minutes. “Some of you may think this doesn’t sound like much time at all – but every single day at court there are delays, adjournments, and rescheduling of court hearings at the last minute. But add to the mix court staff, magistrates, defendants and witnesses being held up even more by public transport – and the number of cases actually heard in court would no doubt be even worse. In a statement, the MoJ said: “Unlike the other seven courts which are freeholds owned by HM Courts and Tribunals Service , Cambridge Magistrates’ Court is a long finance lease with restrictions on use. I don’t remember the News crying ‘local’ when two other magistrates’ courts in Cambridgeshire were closed in recent years. Is it, perhaps, because this particular court is on its doorstep, thereby allowing for an easy live blog or two?